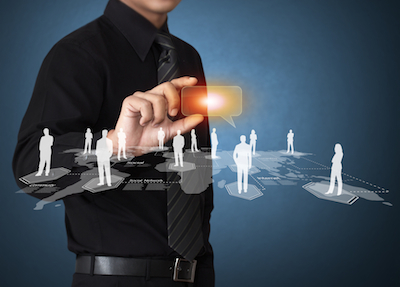 Supply Chain Network: technology provider or business partner? In the last few years we have seen a significant shift in the role of technology firms with their customers. We all know that once a firm installs software, they become reliant on the performance of the product and on the tech company. The lack of attention by users to this important relationship has always mystified me. It may be a sign of trust, but it also deprives the purchaser of the ability to leverage what the tech company can do for their business. So it is interesting to note the evolution of the supply chain market1 in the last few years. A new relationship has occurred, a migration from the buyer/supplier relationship to that of a partner at the table—a channel business partner and market creator. The supply chain network is the center of this relationship. The internet was a huge leap forward. Technology enablement on the web changed the way we work—and who we work with. It is not a stretch to say that the web has enabled the world of outsourcing we have today. For many companies, portals and exchanges became the two main conduits over the internet. If you wanted to do business with a supplier, say, XYZ Co., you had to use, not just any portal, but their portal. Even though that portal might have been Ariba, TSC, Epicor, or whomever, the portal provider’s brand was subservient to the name of the trading partner. Supplier/Customer ruled. Another key factor here is that the information in this world belonged to the customers and suppliers—not the tech providers. The portal was generally not the system of record nor the generator/creator of the business data. XYZ Co.’s business process was overlaid on the system. Although the XYZ Co. may have spent a few years building on their portal, they could always switch to a new portal player. Ultimately, though XYZ Company was using the web rather than fax, it was enabling a more traditional business model and relationship—Buyer/Supplier—one-to-one or one-to-many. A rather different model also emerged at the same time: the idea that the web was a big automated telephone book, powered by search engines where one could find customers to do business with. A pure web search can yield important results, but a more efficient way is to have a third party do a little upfront homework and organize all the relevant companies in your industry by topic, services, geography and so on—the directory model. It was the virtual trade show. It was a great idea, and many directories flourished for a while. Then things got a bit out of hand. With a low barrier to entry, ‘everyone was doing it.’ And with no or low revenue streams, the directories were not really ever complete or kept up to date. So why not make B2B look more like B2C and generate revenue by using the site for commerce? This led to the creation of exchanges. For a while these flourished too—virtual wholesalers on the web. They were going to disintermediate all those businesses. 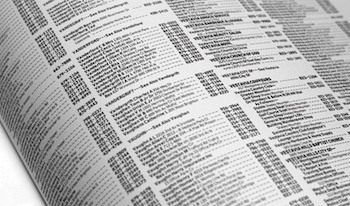 However, once wholesalers and manufacturers got the hang of using directories, they were able to efficiently build their own sites and use web search, aggregating tools and place ads on the Google and Yahoo search engines to be sure they showed up when customers needed them, drawing buyers directly to them.2 Exchanges, though many-to-many, were very much relegated to one-off transactions. ChainLink has been writing a lot about the network phenomenon and why it is different than other cloud or technology approaches.3 Networks focus more on technology enablement of many-to-many relationships and reduce risk and friction in the chain. But there are other elements that are emerging—the technology firm as a partner at the table with the business. The concepts here focus on the morphing of a tech company into a market nexus. A prime example would be Uber. Where would all those drivers be without Uber? 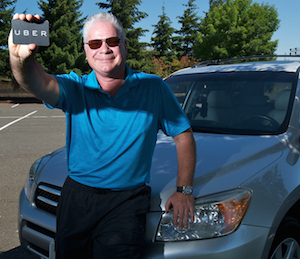 The Uber effect has created a huge list of new types of business networks. Some are really more like exchanges—one transaction at a time. But some, just some, become power players in the network. Why only some? B2C is fairly straightforward to understand. I post myself on Angie's list, maybe create some advertising or search optimization and find customers. Conversely, customers search for service through the network. But customers still have a choice of how they search. They can use Angie for one service, but still seek out Yelp, Google, or whomever the next time. Though Angie makes it easier, Angie is not all powerful. In fact, the web is full of new entrants for specific company services or for directory sites with lists of suppliers that are searchable. The idea here is that there is a lack of concentration or exclusivity of business interactions and trade. The corollary in B2B is that an end-user can buy software today that allows them to use or integrate to multiple portals or partner sites to manage transactions. Thus spend—and reliance—are diffused. Networks increase the total size of the market. Often they don’t replace existing applications. They add to the supply chain market. Due to the ease of onboarding, members easily add more of their trading partners who might have been manually transacting in the past. End points still use their MRPs, their EDI and so on, but they process their interactions through the network. Once they are established in the network, they adopt more applications. Networks are always with us. They are ever present—always on. Their systems and services monitor user activities and schedules to ensure that interactions happen according to plan. They tell the user when execution does not occur. They send alerts and suggestions to identify issues and suggest better alternatives. They host meaningful business data—the source for new business applications and services. This data is the source of new solutions—providing prescriptive applications based on big-data history; analyzing many decisions and results (as the healthcare industry is doing4); or providing indexes such as risk and performance, commodities rates, supplier performance or other data that is exclusively available in the network. There is no other source for this information. They become the exclusive channel for trade. Most importantly, networks become the channel for doing business in certain markets or with certain companies. On one level, the concept is not new. Back in the early dot com era, there was an attempt at industry consortia. Some of the B2B networks today are an evolution of these ideas. Though some of them got their original funding to be consortia in an industry (e2open, Covisint,5 and so on) during the dot com era, they were not necessarily able to maintain the consortium concept. However, they kept many of the members with a shift in charter. A power network is not just a channel—it is the channel. No doubt these networks initially derive their presence and power due to their customers. But once they are in place, they become entrenched. Let’s take company XYZ again. XYZ goes to SC.Net seeking to do business with MNN. They see MNN and other business partners are ‘already there’ in the network. This makes joining easy. No doubt, it seems as though there are more than a few choices in networks. But actually, there are only a few6 (since it does take a great deal of funds to create, grow, and manage them). And generally, they are the only way to do business between trading partners. After all, we are not going back to the fax. And, unlike the portal, all the data is not only on the network, it is in the network—created, generated and managed by the network. 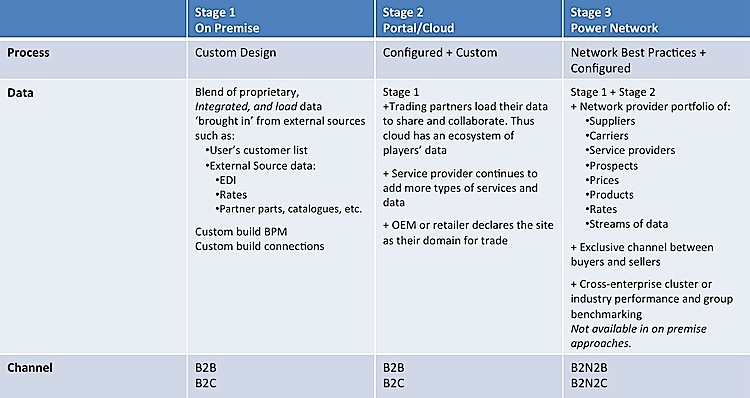 Yes, a company can still choose portal—and some big companies do, but they are used more for one-to-one communication, for example, a PO to commit/confirm. And in the portal, the XYZ Company is still responsible for managing the data, building/managing the business processes and so on. That can be expensive. No doubt, software provider companies aim to be quite helpful in all this, providing EDI pre-connections and so forth. But they are not in the business of helping you build your business. Here are some examples of power networks. Although they may not be flexing their muscles or swaggering, the fact remains they are entrenched networks for many. In the transportation sector, Descartes and GT Nexus are beyond mere cloud providers. Rather, they seek out and host data. For example, Descartes’ strategy is to provide trade content (Customs Info). Network and community architecture drive a lot of sales for them. But they choose to have their applications on the cloud/network. GT Nexus, on the other hand, has their code in the network. That is not just an abstraction, since they become the system of record for supply chain processes. One of their approaches is their big data/analytics, where they benchmark millions of shipping transactions, carrier performance, and charges to help companies understand how they are doing. This kind of information cannot be found from another source. The auto industry is a good example. Covisint is the core trading hub for suppliers to transact with the big auto customers. Exostar, initially, was one of those dot com phenomena started by Defense suppliers, BAE Systems, Boeing, Lockheed, Raytheon, and Rolls-Royce, who formed the core back in 2000. JDA, though not ‘technically’ a network instance, becomes a full business partner in the relationship, working with Logistics Service Providers for a joint ‘go-to-market strategy’ for the LSPs’ service, with JDA as the platform. Examples in Supplier Collaboration may be Ariba and GT Nexus. Both companies, of course, are in the cloud. GT Nexus has all the interactions from source through pay, whereas Ariba has procure to pay (for indirect only) today. It is harder to assign indirect procurement to this power status. But big customers dictate to suppliers that the way to work with them is through Ariba. Ariba derives their power, therefore, from the customer. This is the portal model. One Network is another concept. Here the goal is to be a de facto standard—an industry backbone—for a cluster of trading partners or an industry. WWRE, back in the day, was such an attempt for retailers. Like all good business partners, networks make an effort to keep their customers/partners coming back. (After all, the EDI power players who did not keep up or abused their power are now swallowed up—their old brands devalued.) Descartes, for example, built a community to search, share content, and create private subgroups of trading partners. GT Nexus built their Shipper Council so not only would they have the voice of the customer (really powerful customers) in their services, but they can be an active facilitator of relationship building amongst the network members. JDA, technically, may not be a network, but they have those business partner attributes—a joint go-to-market strategy with LSPs. Often we determine the power of companies by things like the market share, revenue, and so forth. There are many large ERP providers, cell phone carriers, and other examples, that have mega revenue and share. And, no doubt, once a customer selects a software product, they become highly dependent on it. However, if motivated enough, they might switch. They take their marbles—their data, processes and proprietary methods—and go home. Not so with the power network. Thus, customers should become a lot more involved in their network company’s strategy and direction as they evolve. In many cases, cloud players have led their customers—speculatively designing and generating new ideas and getting funding to fuel them, rather than simply waiting for and depending on the revenue generated. Customers often follow. They expect the leading tech firms to do just that—lead. However, as industry-specific supply chains evolve, adding your network provider in the loop (with their strategic thinking) will ensure that your vision is executed. Of course, you really only have power if you realize you have power. Some of the companies mentioned might cringe at the idea of being positioned as powerful as their customers. Some, while feigning humility, would take secret delight, while others know it and the swagger is obvious. Suppliers know the difference between having a collaborative relationship with their retailer or OEM and being dictated to or threatened by the more powerful. As in any relationship, partnership is not power for one party only. Successful partnerships strive to ensure ongoing mutual success.